If you could look down on the solar system plane from outer space today, you would see that the sun, Earth and Jupiter form a 90-degree angle. Astronomers will say that Jupiter is at eastern quadrature – or 90 degrees east of the sun – today. Geometric markers such as these, for planets and moons in our solar system, are more than just academic. They indicate where you can find these bodies in our sky – and serve as hallmarks in our monthly or yearly observations of neighboring worlds. For example, when the moon is at eastern quadrature – or 90 degrees east of the sun – we say the moon is at the first quarter phase. At such times, the moon is at its highest in the sky when the sun goes down, and it sets around local midnight. So it is with Jupiter tonight. This bright planet is now approximately highest in the sky at sunset, and sets near midnight. You can easily spot Jupiter because it is the brightest star like object in the sky. 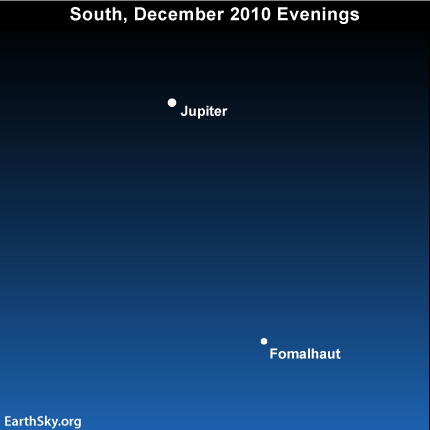 About three months ago – on September 21, 2010 – Jupiter was at opposition. It was opposite the sun in Earth’s sky, or 180 degrees from the sun. If you had looked down on the solar system on September 21, you would have seen the sun, Earth and Jupiter making a straight line in space. Opposition and quadrature can only happen to solar system bodies that orbit the sun outside of Earth’s orbit. Planets that orbit the sun inside of Earth’s orbit can never reach opposition or quadrature. In other words, they can never be 90 degrees from the sun as seen in Earth’s sky – never straight up in the sky at sunset. Instead, they always remain near the sun as seen from Earth. We see them either in the eastern twilight before dawn or in the west after sunset. Jupiter’s oppositions and quadratures enabled the innovative astronomer Copernicus (1473-1543) to compute Jupiter’s distance from the sun. He did this by charting Jupiter’s (and the Earth’s) change of position from opposition to quadrature. All the while, Copernicus presumed that Jupiter and Earth both orbit a central sun. By using the Earth-sun distance as his baseline, Copernicus relied upon the magic of geometry to figure out that Jupiter is over 5 times the Earth’s distance from the sun! Look for Jupiter tonight as it stands at eastern quadrature, or 90 degrees east of the sun – highest in the sky when the sun sets in the west – on Thursday, December 16. Site contents copyright © 2019 Recorder Online	except as noted. All rights reserved. | 85 queries in 1.243 seconds.